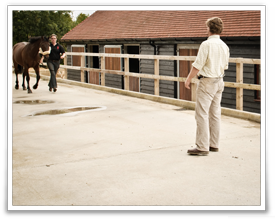 Management and treatment of the sport horse is a speciality of Blackdown Equine Clinic providing veterinary care to some of Britain's best showjumping, eventing, dressage and polo horses. Our vets have a strong passion for sport horses and always aim to provide the highest quality personalised care for all equine athletes. In support of this our vets are equipped with advanced diagnostic imaging equipment including digital radiography (X-rays), and high quality ultrasound machines and endoscopes. We also have a portable gastroscope for on-yard investigation of gastric ulcers.